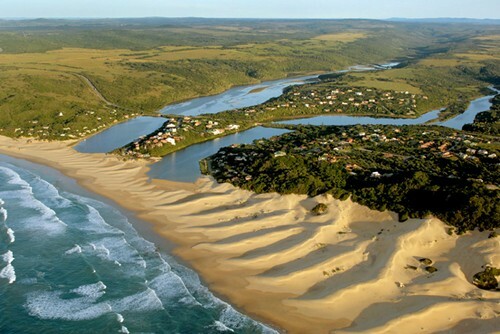 Without sounding reminiscent of a tedious marketing spiel, Kleinemonde, just 20 kilometres or so from Port Alfred between Port Elizabeth and East London, is about miles of white sandy beach, intermittent sand dunes, serene tidal pools and peace and quiet. The little town of Kleinemonde lies on twin rivers - east and west Kleinemonde - that when the rains are good, flow into the sea via lagoons. Fishing, swimming and boating up the rivers are some of the major pastimes when staying here, the banks crowded with indigenous vegetation and ancient cycads that only add to the already incredible atmosphere. Time spent in Kleinemonde really is about getting away from it all. The town has little more than a good restaurant, a café for bare essentials, and a petrol station. Yet you haven’t far to go if it’s good shopping and eating you’re after. Kleinemonde is just 12 kilometres from Bathurst, a quaint settler village, and Grahamstown is only 60 kilometres away. Port Alfred, with its weekly market stalls and good shopping, is also just around the corner.